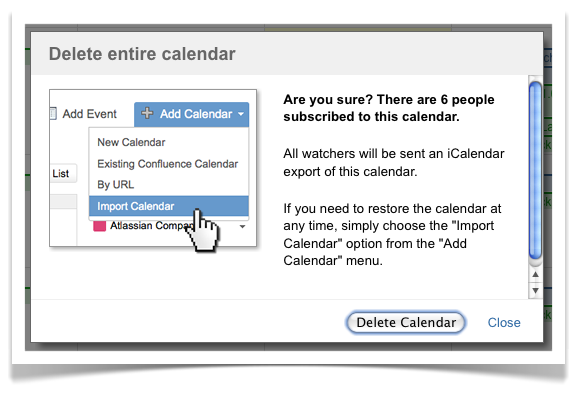 12 July 2011The Atlassian Team Calendars team is pleased to announce the release of Team Calendars 1.1. Now you can "watch" calendars to be notified of any new events created or changes to existing events. We've also made your calendars safer by preventing accidental deletions and added a number of other new features. When a new event is created. An existing event is edited. An existing event is deleted. The entire calendar is deleted. Note: that you can watch People Calendars and Events Calendars only. You track important events in your Team Calendars so we want to make sure they're safe. So in Team Calendars 1.1 we've added delete confirmations. 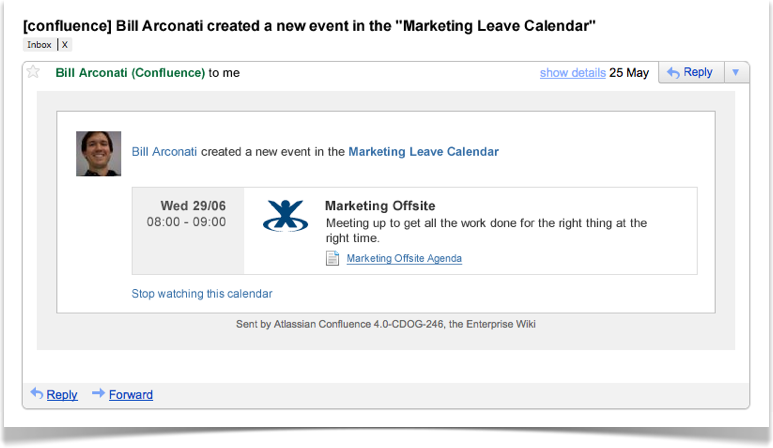 Team Calendars will now ask you to confirm before deleting any events. There are times when you may want to recover a calendar that had been deleted in the past. Whenever you delete an entire calendar, Confluence will now email a backup file to anyone subscribed to that calendar. You can later use this file to restore the calendar if necessary. All events in this series. Hover your mouse cursor on a user's avatar to see more details about them. 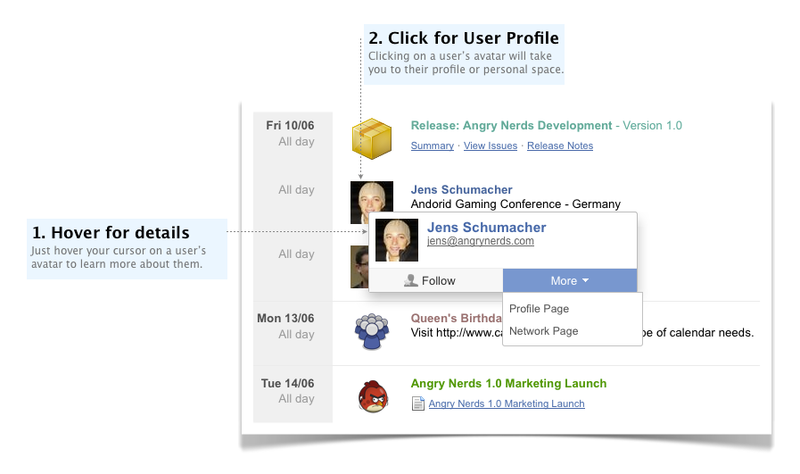 Click on a user's avatar to jump to their user profile or personal space. When you view your Team Calendars for the first time after upgrading to a major feature release, like version 1.1, you'll see small dialog with a quick summary of new features that are available with a link to the release notes. We hope this will aid discovery of new features amongst your users that do not typically read release notes. 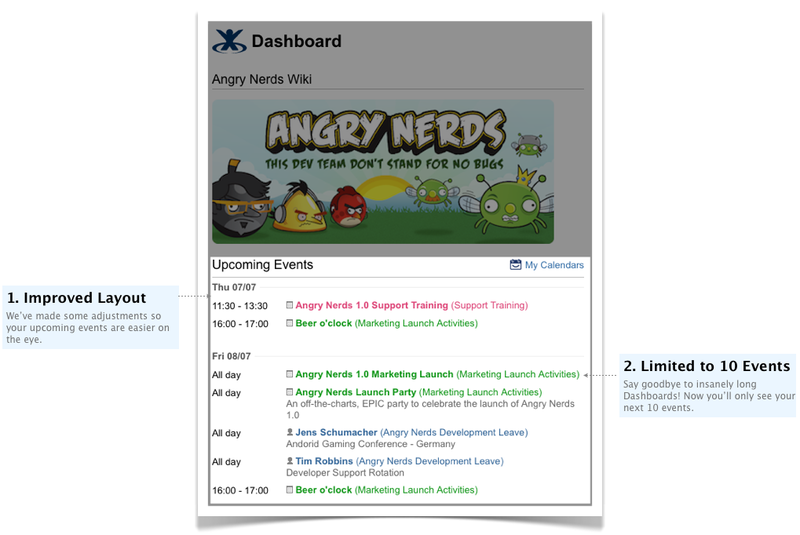 Currently the Upcoming Events view on the Confluence Dashboard shows upcoming calendars events for the next 5 days. In Team Calendars 1.1 this view will now display the next X number of upcoming events, helping avoid a Dashboard that never ends! 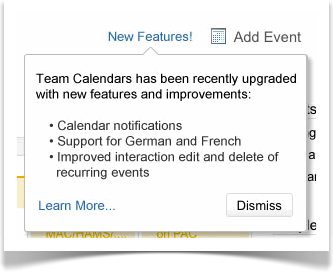 French and German Translations: Team Calendars now has translations for the bundled language packs in Confluence. My Calendar view: Team Calendars how remembers which calendars you want shown and hidden even after you refresh the page. My Calendar view: Text for hidden calendars is "grayed out" to make it easier to see what is hidden and what is showed. Calendar Macro: When inserting a macro, users can now specify calendar macro width in the format of "x px" in addition to percentage. Calendar Macro: When inserting a macro, the dropdown now shows the default view selected in the macro browser. To upgrade to 1.1, simply click 'upgrade' in the Team Calendars entry of the plugins administration screens. See Team Calendars on plugins.atlassian.com for more information.